We have a common Teaching and Learning Model which contributes to better planning, consistent language and clear expectations across the whole school. This ensures that units of work and lessons achieve their purpose, which is effective student learning. 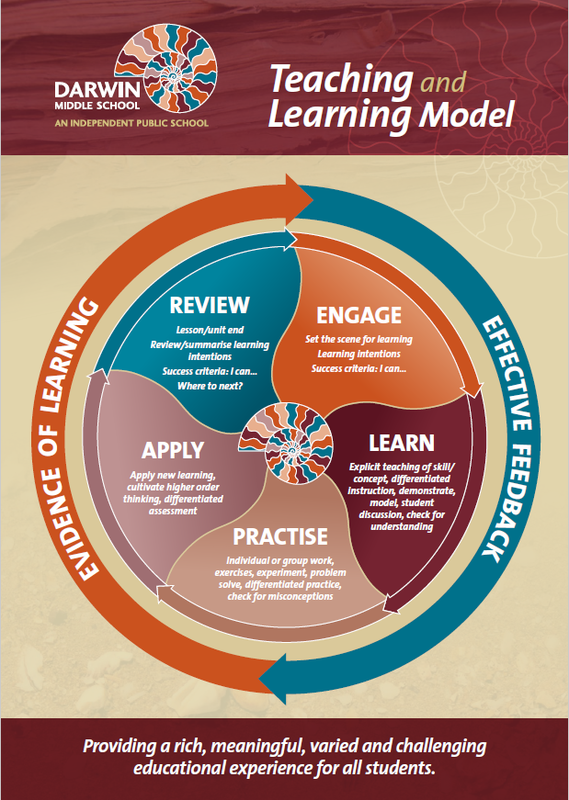 All teachers are expected to follow the structure of the Darwin Middle School Teaching and Learning Model as they plan and deliver a comprehensive curriculum that meets the needs of all students. In 2016, Darwin Middle School was successful in gaining an Independent Public School status. We officially commenced operating from the new Constitution in 2017 after the March AGM. The Good Standing Awards Program aims to recognise, acknowledge, celebrate and reward endeavour, good behaviour and achievement in school and in the wider community. We are totally committed to quality teaching, hence the core business of teaching and learning is our priority. Our model will consistently demonstrate the value of students and teachers being partners in the learning process. The School Board consists of parent members, school staff and non-school stakeholders. These members either have a local interest or can offer specialised professional expertise to benefit and support strategic initiatives. Darwin Middle School has a long history of proven success, we opened our doors to the community for the first time in 2007. Our initial enrolments were around 400 students, which has doubled today and now sits at 800. We are the largest middle school in the Northern Territory and this is complimented by extraordinary resourcing including numerous science labs, performing arts spaces and large spacious classrooms. A Student Representative Council (SRC) is a group of students elected by their peers to represent all students within the school. SRC's work democratically to represent the student body in school decision-making and organise ways for students to participate in and enjoy school life. Integral to a positive learning model is recognising the importance of the social and emotional wellbeing of every student at Darwin Middle School. Students in hair nets and teachers in chefs aprons! Our school canteen, Driftwood Cafe is part of a program that teaches year 9 students, not only the basics of cooking but also develops organisational skills and business skills. Through our partnerships we aim to further engage students, improve academic outcomes and enhance the social and emotional well-being of students. We also aim to strengthen professional learning opportunities for staff and foster partnerships with other professional organisations.